To us Argentina is the ultimate destination for a luxury holiday. It ticks all the right boxes, with it’s breath-taking landscapes, fascinating cultures, amazing landscapes and of course a burgeoning food and wine scene. Recently we’ve been exploring the northerly realms of the country that lie in the shadow of the majestic Andes Mountains. Here near the borders of Chile and Bolivia nature rules the Northwest region of Argentina, working wonders on this breath-taking landscape to form magical and utterly unique land forms. For this reason, and many more, it’s the perfect place for an intrepid and authentic Argentinian adventure. On this nine night holiday combine the eclectic flair of the country’s capital with the romantic isolation of the Northwestern wilderness and its indigenous communities and you have a perfect Argentinean adventure. Our experts have handpicked the best experiences, picture wine-tasting on salt flats, hikes through valleys with no other tourists in sight and exploring Buenos Aires underground cocktail scene. Start your Argentinian adventure in the vibrant city of Buenos Aires. Literally translating as ‘good airs’ you’ll feel immediately captivated by this bubbly and thriving city. Your neighborhood haunt is the trendy Legado Mítico in the bohemian epicentre of Palermo, known as ‘Palermo Soho’ to Porteños (natives of Buenos Aires) and all who flock here to enjoy the abundant selection of bars, restaurants and shops that are popping up in Spanish-style houses and warehouses alike. You’ll start by spending the evening learning the art of Argentinian Tango – a passionate and addictive pastime. We’ve even arranged for your own private lesson with a professional before a three-course dinner and show. Let your inner dancer free at a late night milonga where you can practice those sensual moves at your leisure amongst other passionate regular milongueros. If you’re looking for something a little bit different however, we’ve got just the thing. Be transported back to the Prohibition days of the 1930s on this secret saunter through the speakeasy-style bars of the city, sampling tasty cocktails in the most exclusive and hidden locations. By day explore all that this eclectic city has to offer, from a bustling market tour with your own private chef where you’ll learn to make those delicious empanadas, a local delicacy that has spread worldwide, to strolling past Casa Rosada picturing that iconic scene from Evita and down the streets where famed Jorge Luis Borges wandered in search of inspiration for his writing. After an activity-fueled few days in the capital, it’s time to head North to where a collection of indigenous hubs, nestled amongst national parks and natural wonders, await you. Your first stop will be the charming House of Jasmines in the Salta region, set in hundreds of acres of babbling brooks, eucalyptus trees and gardens that will create a magical haven to unwind in. Spend the afternoon relaxing by the pool looking out to the spectacular Salta mountain range, before enjoying a cooking lesson with the head chef where you can master the art of Andean cooking making delights such as Empanadas, Tamales and Humitas, all washed down with a drop of Torrentes. After a truly relaxing experience, it’s time to head off on a road trip through Cachi, witnessing impressive landforms, from the undulating Quebrada de Escoipe to the Cuesta del Obispo, where you’ll enjoy panoramic views of the meandering Valle Encantado. This is a road trip like no other, as you leave the zigzagging and cross Los Cardones National Park via the ancient Inca path of Tin Tin that is impressively straight. Take in more stunning scenery at your home for the night, La Merced del Alto, set in the heart of the Valles Calchaquies. Today we head towards the Cafayate wine region, second only to Mendoza when it comes to world class wines. On the way we’ll take you on a trek through a nearby valley to visit some hidden caves, the Cuevas de Acsibi, that are totally off the tourist trail, if you’re lucky you’ll even spot a condor along the way. Around each corner there’s a formation that differs from the previous, as you trek through numerous caves, illuminated by light flooding through small crevices. Learn how ancient settlers came to perform rituals at this magical location, and feel privileged to have found this hidden treasure in the Argentinian wilderness. Where better to rest your head in Cafayate than in a Master Suite at Patios de Cafayate, your exclusive wine hotel, overlooking rows and rows of vineyard with a backdrop of undulating mountains and valleys. Not before a wine tasting and tour around the estate though, followed by a visit to nearby Bodega Piatelli for a boutique wine-paired lunch, soaking up all that your surroundings offer whilst making the tough decision of choosing between Malbec and Cabernet Sauvignon as your next treat. 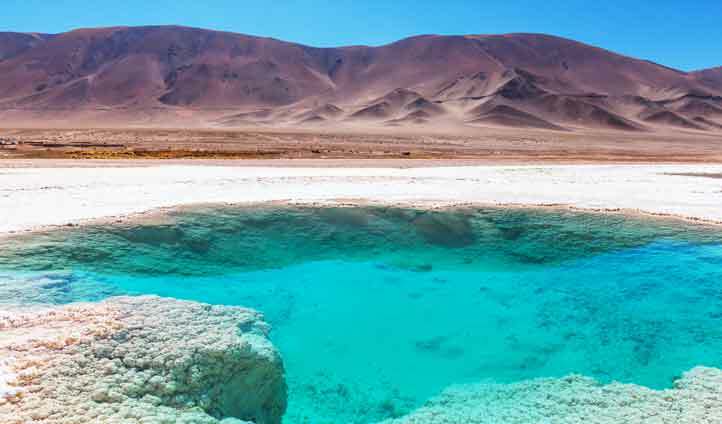 The phrase ‘save the best till last’ springs to mind on this Argentinian adventure, as you head north to reach the region’s capital city of Salta. Visit the Cathedral where iconic patriotic hero General Güemes rests, and San Bernardo Convent, Salta’s oldest religious building and best example of indigenous and colonial art in the city. The true pièce de résistance, however, lies even further north in the Jujuy Province at the Unesco Site of Quebrada de Humahuaca. This natural spectacle is not worth missing on your journey through Northern Argentina. Picture layers and layers of creamy white sediment mixed with deep reds and vivid greens to produce a unique landscape of colour that will delight your senses. Your final lodgings on this journey is the calming Manantial del Silencio, at the foot of the majestic and marzipan-like Cerro de Siete Colores, iconic and awe-inspiring all one and the perfect place to reflect on your adventure. Forget Salar de Uyuni in Bolivia, we’ve got Argentina’s answer to the best salt flats around. 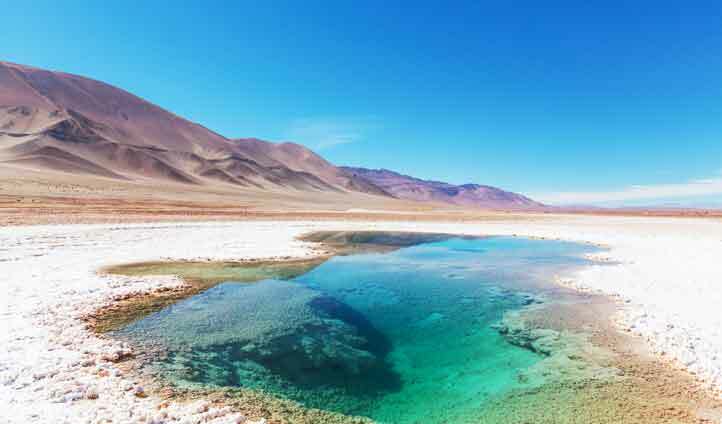 Take a day trip to Salinas Grandes at 4140m above sea level, and with over 12,000 hectares of salt that create a startling contrast against the clear blue Argentinean skies. Check out the rectangular salt basins from where the salt is regularly dug out or simply stare in awe at the panoramic scene before you, a stark contrast to all that has come before on this adventure, and so ending the trip on a high, literally. For one last amazing experience your guide will set up a private wine-tasting experience where you can enjoy the splendor of the salt flats with a glass in hand.